My first thought was to write a review of the film, The Soloist, which is about the charismatic homeless musician, Nathaniel Ayers. Jamie Fox stars as as Ayers and Robert Downey, Jr. as Steve Lopez, the Los Angeles Times journalist who penned the book upon which the 2008 film is based. However, rather than deconstructing the film, already done by many critics, I am just going to talk about the relationship between the two men. Steve Lopez comes off as a world-weary columnist in search of a much needed story who finds his inspiration in a rag-tag street musician he happens to meet in a Los Angeles city park. Whether you are in Los Angeles or New York City, there is never a shortage of oddballs on the streets, but it takes a writer's eye to spot a human interest story in one of them as Lopez did that day. Conversation with this character turns out to be trippy; convoluted and eloquent at the same time. Captivated by the amazing stream of information emanating from a guy who is obviously homeless, Lopez realizes that this fellow is challenged in some serious way, yet is well educated, a gifted musician and also very elusive. He may be rag-tag, but his rags are flamboyant, dressed up with multicolored scarves and a trademark hat. His life possessions roll along wherever he goes in a cart matching his bizarre appearance, looking a lot like an artsy street fair booth on wheels. It takes some time and effort for Lopez to keep track of the intriguing stranger after their initial meeting, but he finally locates Ayers' daytime hangout under a freeway near Skid Row where he plays Beethoven on a beat-up old violin with only two strings. Lopez becomes a regular visitor, gradually getting Ayers to acknowledge his presence and talk with him again. 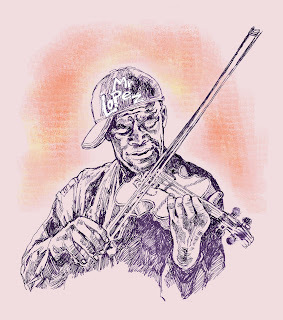 Mostly though, he becomes transfixed with the image of this middle-aged homeless man and the soul-stirring sounds he is producing on the battered violin. He sees the euphoric expression on Ayers' face while he is playing and as the days go by he becomes emotionally involved with the musician and his music. The deadline-driven journalist begins morphing into someone who cares more about the man than the story he has been chasing so frantically. Along the way, Lopez discovers that this hobo-like man on the street corner had once been a musical prodigy growing up in Cleveland, Ohio, who went on to study cello at the Juilliard School in New York City on a scholarship: A considerable achievement for anyone, but doubly so for an African American in the 60s. Tragically, he suffered a mental breakdown in his junior year and he was forced to withdraw from his studies. After going home to live with his mother, he was diagnosed with schizophrenia and underwent years of therapy including shock treatment which did not improve his condition. His mother died in 2000 and he ended up going to Los Angeles where he thought he might find his father. Ayers, who lost so much to mental illness, makes an extraordinary adjustment to his situation by totally immersing himself in his music. He spends years playing music on the streets of L.A., and when he meets Lopez he has long been accustomed to his lot; he is where he wants to be, far away from the horrors of psychiatric treament and the pressures of a so-called normal life which he could not handle. Lopez, however, brings about a sea change in his friend's life because of his stories about him in the Times. Many instruments, including a cello, are donated replacing the old violin, and he receives an invitation to watch the Los Angeles Philharmonic whose members go on to give free lessons to the man who has been without any formal training for so many years. Lopez also arranges to take him to a practice session where they are playing Beethoven, Ayers' favorite composer. Both men are mesmerized ... Ayers by the music and lopez by the rapture on his friend's face. But as Lopez becomes dedicated to improving Ayers' life he crosses a line or two. He abruptly gets him an apartment which, at first, brings up very bad memories for Ayers, although he eventually embraces this haven off the streets. Lopez becomes involved with arranging a public performance which paralyzes the musician. And then the worst though well-intentioned move ... he tries to get Ayers to see a psychiatrist and almost destroys the friendship. It seemed to me that Lopez wanted to "fix" his broken friend so that the man could live like a "normal" person and fully realize his musical potential. Thankfully, Lopez recognizes his mistakes and is able to learn how to accept Ayers for who he is. Making life better for the challenged genius is incredibly generous and appreciated up to a point, but simply being his friend is by far the most important thing he ever could have done. With all the advantages and attention Ayers has gained because of Lopez, to this day he keeps on blissfully playing his music on the back streets of Los Angeles. The heart of the film is how both characters evolve as their relationship develops. And what is most amazing to me is how Ayers, caught in the quagmire of mental illness, often appears to be the wiser man. Despite his need for a friend, his priorities are in proper order. On the other hand, Lopez writes that his life values were completely redefined as a result of getting to know this extraordinary person, Nathaniel Ayers. The Soloist is ultimately about the meaning of friendship. It is not, as some might expect, a Hollywood story about turning a sick, homeless musician into a famous performing artist. Actors Jamie Fox and Robert Downey, Jr. deliver the message about the unique friendship with consummate skill while the powerful sounds of Beethoven unite the characters as well as enthrall the audience. Thank you for writing this wonderful story. Upon reading it I immediately went back and read it again lest I inadvertantly missed something. I have not seen the movie but now feel I may enjoy watching it. You have not only written a fasinating true life story but you have done in a your own special and expert story telling style. Bravo. Ellie, I'm assuming that's your illustration of Ayers -- love it! You really captured the spirit of the man with your art and your article. I love the story EM. You always did have a way with words. I remember the first day we met, and that has been at least 50 years ago.